Are you looking for low-cost, high-accuracy solutions for your ESD awareness system? You might want to check out Transforming Technologies’ Resistance Ranger Constant Monitors Series. Resistance Ranger Constant Monitors continually monitor grounding product resistance levels to let you know that your ESD workstations are grounded and will sound an alarm if those products fail. They accomplish this high-accuracy monitoring by using an ultra-low voltage sensing current and are designed for use in the most sensitive environments and processes. RangerOne (CM1601): The simplest and most cost-effective Ranger Constant Monitor. The RangerOne monitors the resistance of one person/wrist strap and also provides a second unmonitored ground jack. RangerTwo (CM1602): The mid-level Ranger Constant Monitor. The RangerTwo monitors the resistance level of one person/wrist strap and the worksurface and also provides a second unmonitored ground jack. RangerPro (CM1600): The premiere workstation grounding system of the three Ranger Constant Monitors. The RangerPro uses a continuous pulse of an ultra-low voltage signal to measure the electrical resistance of two wrist bands, two work surfaces, and two auxiliary grounds simultaneously. This top unit also provides two additional unmonitored ground jacks, has an output to hookup to an external alarm, and is enclosed in a stainless-steel conductive case. 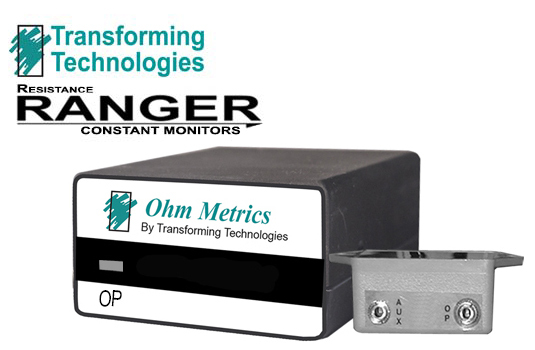 Please Note: The Transforming Technologies Ranger Constant Monitor Series is factory-calibrated and does not require annual recalibration. It is, however, recommended to verify proper working order of the monitors with the CM2015PV Periodic Verification Unit. Visit QSource.com to purchase a Transforming Technologies Ranger Constant Monitor. You may also contact us by phone (800-966-6020), email, or via our Web site. QSource.com also offers a complete selection of other Transforming Technologies products (including wrist bands, mats, lab coats, ionizers, and more).